The full route can be undertaken in 6, 7 or 9 days depending on your pace and the amount of time you wish to look around. It is worth taking your time or adding in some rest days to visit the nature reserves along the coast and enjoy the peaceful beaches. The 7 day walk allows you enough time to have a look around but covers a reasonable number of miles each day with a few longer days. After spending your first night in Thetford, a taxi will take you to Knettishall Heath, the start of your walk. The first few miles follow a wooded path before gently climbing to the raised Roman causeway to the river Thet. Make sure you bring your binoculars as you will be passing the Brettenham Heath, a large area of heathland with many bird species. You will soon arrive at the village of Stonebridge which has a pub for some welcome refreshments. After Stonebridge you will see a series of stone sculptures along the trail which are inspired by the rich history of the area. A straight road leads to Castle Acre through largely agricultural land. The village of South Pickenham is worth a visit for its historic church dating back to 1075, a 15th century wall painting of St Christopher and a winged door organ. At Castle Acre you will arrive through the Bailey Gate, this is one of two stone gatehouses added to the town’s defences in about 1200. The road into the village runs between its towers. The Castle Acre Priory and castle are a must see, the priory dates back to 1090 and the castle was established just after the Norman conquest. There is a shop, pub and a couple of tearooms with homemade cakes. The road leads on through gentle countryside to Holme-next-the-Sea, the end of the Peddars Way. The last overnight stop on the Peddars Way is in Hunstanton three miles to the south-west. You can walk back to Holme-next-the-Sea underneath or over the top of the cliffs depending on the tide, When the tide is out it is well worth taking the beach route to admire the beautifully coloured cliffs. The village of Thornham offers a pleasant lunch stop with some historic pubs. The path continues along marshland and intertidal mudflats with plenty of birdlife, you will also pass some fishing shacks where you can buy freshly dressed crab, whelks and cockles. You will then continue towards Scolt Head through the dunes and marshes and finally on to Burnham Overy Staithe. A beautiful section of the coastline with plenty of beaches all the way to Wells-next-the-Sea, the white sandy beach of Holkham Beach being the most well known. The backdrop of pine woods and dunes make for a spectacular combination, on a nice day one of the best beaches in Britain! After passing through Holkham Gap the trail continues through the pine woods and past a boating lake. You can access the beach here to have a look at the colourful beach huts. If your legs have had enough at this point it is possible to take a miniature railway into town. Another lovely day of coastal walking along salt marshes, there are a few nice little towns along the way where you can sample the local seafood. At Blakeney you will be able to see out to Blakeney Point, a 16 km long spit with a permanent seal colony and an abundance of birdlife. It is possible to take boat trips to Blakeney Point or walk in via Cley but you will need to factor in a rest day. Passing Cley next the Sea you will walk along a shingle ridge with wide views of the coast line towards Weybourne. The final stretch to Cromer follows the sea cliffs towards Sheringham, a pleasant town for a lunch stop with a large beach and a proud fishing heritage. A gentle climb takes you to Roman Camp and then on to the highest point on the route (102 m) at Beacon Hill. The walk finishes on Cromer pier, a fitting end to the seaside walk! This is a mainly flat walk, and can be completed by people with limited walking experience. Terrain: Flat walking along coastal paths, country lanes, beaches and trails. What’s it like underfoot? On the whole the paths are well defined and maintained. How Much Up & Down? Very little, the route is mostly flat, particularly the inland section. Along the coast it can be slightly undulating. Signposting: As this is a National Trail walk the signposting is very good. Accommodation Overnight Bed and Breakfast accommodation in selected hotels, farmhouses, village inns, guest houses and family B&Bs. Full English or Continental breakfast. Maps 3 Ordnance Survey Landranger (1:50000) maps covering the entire route. Packed Lunches Provided for each day’s walking and recommended on this holiday as there will not always be a handy shop or cafe on the route. One of the great features of our Peddars and Norfolk Coast holidays is the quality of the accommodation, including small country house hotels, guest houses, bed and breakfasts and farm house accommodation. In selecting the accommodation we look for helpful, friendly hosts with good quality, characterful accommodation close to the trail. We always try to arrange en suite accommodation, i.e. rooms with their own bathrooms for each night of your stay. However, in some of the more remote locations accommodation is limited and occasionally we may have to book rooms with shared bathrooms for one or two nights of your holiday, (especially if the booking is made at short notice), but we will always let you know if this is likely to be the case. Single Rooms We are happy to book single rooms on this walk but cannot normally book more than two for any one group. Single room bookings include a supplement. By Air: The international airports with best connections to the trail are Stansted or Heathrow. From Stansted it is 1.5 hrs travel time (change at Cambridge) from Heathrow it is 3 hours travel time, metro to Kings Cross then train to Cambridge, change for Thetford. Norwich has domestic flights and flights from Amsterdam (KLM) Train to Thetford (0.5 hour travel time). By Public Transport: There is a train station at Thetford, your first nights stay. By Road: From the south M11 (Cambridge) then A11 to Thetford. From the north: take M6 Toll and M6 to Newmarket Bypass/A14 in Cambridgeshire to Thetford. By Public Transport: There is a train station at Cromer, travel time to London 3 hours with a change at Norwich. Wells is a lovely town with a little harbour full of crabbing boats, a white sandy beach, Georgian architecture and surrounded by pine woodlands. A pleasant laid back place to spend a relaxing day. There are plenty of small local shops and eateries. 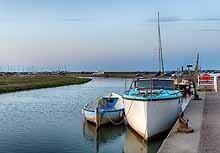 A pleasant traditional fishing village, this is a good place to stop if you want to make a trip out to Blakeney Point. This 16 km long spit is home to a permanent seal colony and has many bird species nesting between April and July. You can take a boat trip out to the spit (times vary according to the tides) or you can walk in from Cley. The seaside resort of Cromer is well known for it’s magnificent pier, beaches, birdlife and many family owned shops and restaurants. There are several nearby National Trust properties with beautiful gardens to while away the day. Alternatively you can take a boat trip to Blakeney Point to watch the seals or go bird watching in what is considered the bird watching capital of Britain.